If you’ve been following the activities at Toast HQ over the past few months you’ll know that we recently produced a 2D isometric motion graphics animation for SABMiller Group Technical. We completed this project that explains the beer-brewing process in July 2012. Then we set about brewing our own beer, thinking it wasn’t too tough. Well, we were mostly right. TOAST Homebru, The breakfast of champions has been a roaring success, with friends and clients raving about its rich, golden colour, steady stream of bubbles and floral bouquet. We’ve had it called a ‘fresh, summery ale’ and a ‘rich, hearty brew’, although only by well-meaning amateur beer drinkers. 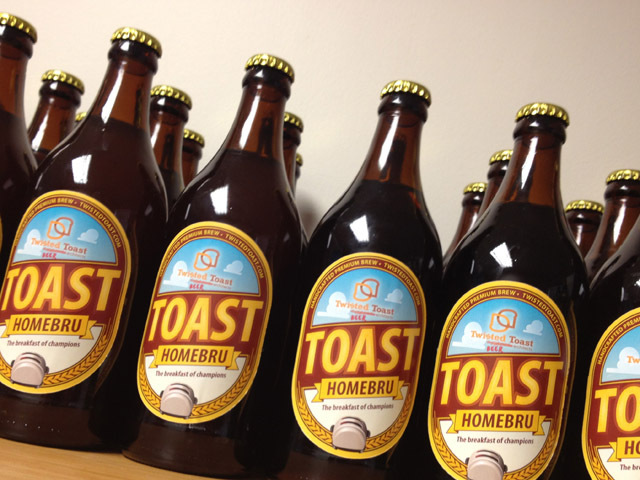 What would a professional beer taster say about TOAST Homebru? What would an entire panel of internationally-renowned tasters say? Until very recently, the world would never know. What we could never have imagined was that Maurice Egan, Group Head: Manufacturing at SABMiller Group Technical sent samples of our beer to an elite tasting panel within SABMiller, chaired by Tanya Hulse, SAB’s Head of Process Engineering and in Egan’s words “one of the company’s best tasters globally”. A number of ale-style characteristics dominate, including a positive hop and apple/aniseed ester aroma. Strongly present is a distinctive phenolic character (spicy, clove-like), which is a signature of Weiss beers/wheat beers, but we’re not sure that it’s typical of this beer style and may be indicative of the presence of a wild yeast. A positive for a home brew is that there is very little sign of oxidation/staling notes in the sample. However, there is quite a pronounced sourness which may be due to presence of lactic acid bacteria – very difficult to exclude in standard home-brewing systems. Distinctively different and very much dominated by the ginger flavour both on aroma and in the crisp tartness and astringency on taste and mouth-feel, supplemented by a relatively high carbonation level (not unusual in this beer style). The ginger may be a little strong, and we surmised that it may have been introduced via addition of a flavour extract of ginger oils, which would explain the lack of foam and a somewhat mouth-coating texture. No marked off-flavours were detected which is very positive, though the pronounced ginger will serve to mask these if present at low levels. As a first attempt at home-brewing craft beer, these are indeed commendable and we hope they’ll continue their efforts. Perhaps we should put them in contact with a local branch of the ‘Worthog’ craft-brewing group, as a great way to take their interest in craft brewing further. We take this rating as a toast to the Twisted Toast home-brewers!